My Tiny House Journey Begins! That picture above is of my custom 32-foot Gooseneck Trailer with an 8.5 foot deck over the gooseneck (maximizes space), on which I plan to build a 40.5 foot long tiny house (38 feet long inside with a 2.5 foot deck on the back, including a 10 foot loft, roughly ~380sf or so). Pretty exciting start on the Tiny House Journey! The trailer cost me around $6,000 and took several weeks to construct. Had I thought to get the flashing added ahead of time (much easier for them to do when building the trailer at the factory than for me to get access to that kind of flashing and attach myself), might have cost me around $7,000 total (probably would be $9,000 plus as configured anywhere else that I looked). The next step is modifying the gooseneck trailer in order to begin insulating the 8-inch cavity floor which you will see in the next post! 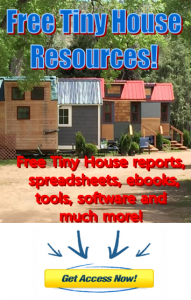 PS> Get the latest updates on my tiny house build as well as free resources, information and training on Going Tiny and Being Free and building your own tiny house and much, much more by clicking here. My Tiny House Journey Begins! Got my 32-foot Tiny House Trailer! Leave me your comments below – I’m pretty excited!! More updates to come!